The summer is quickly coming to an end and the holidays are over. The schools and the academic year for the university have started again, people are back at work and that means the streets are returning to their normal busy state as well. In a lot of cities in The Netherlands that means busy with people cycling. 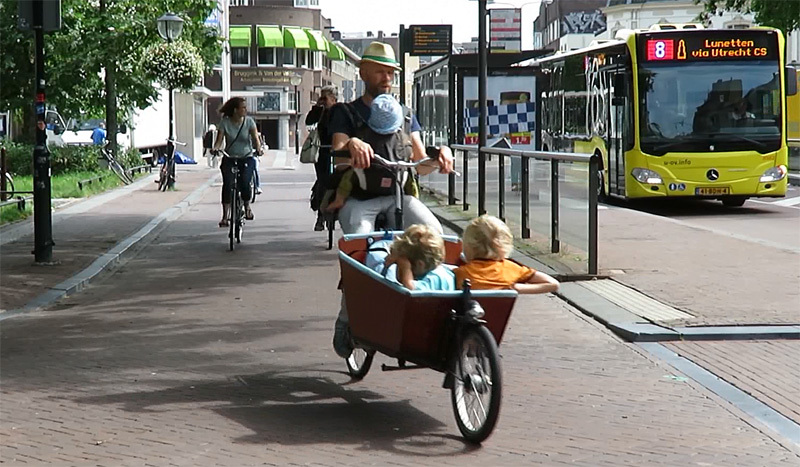 This man cycles with two bored boys in the box and one baby on his chest into the city centre of Utrecht. He could hardly be more relaxed. After the recent posts about bridges, before-and-afters, town and street redesigns, it is again time to look at the people all that is for. 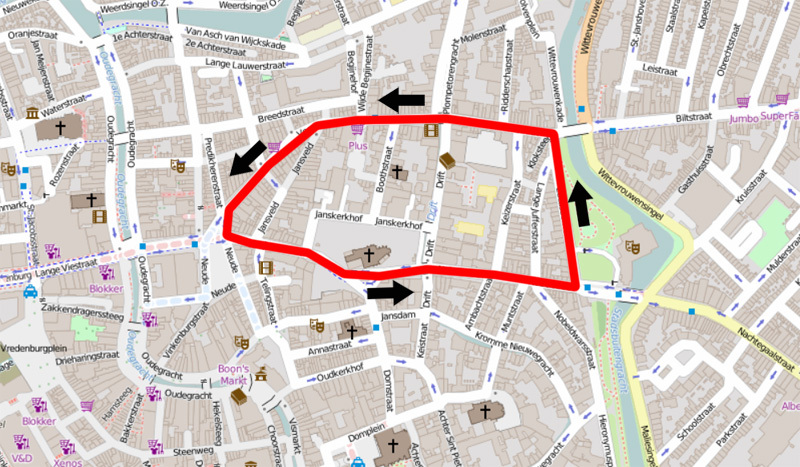 So I went to the east entrance of the historic city centre of Utrecht. 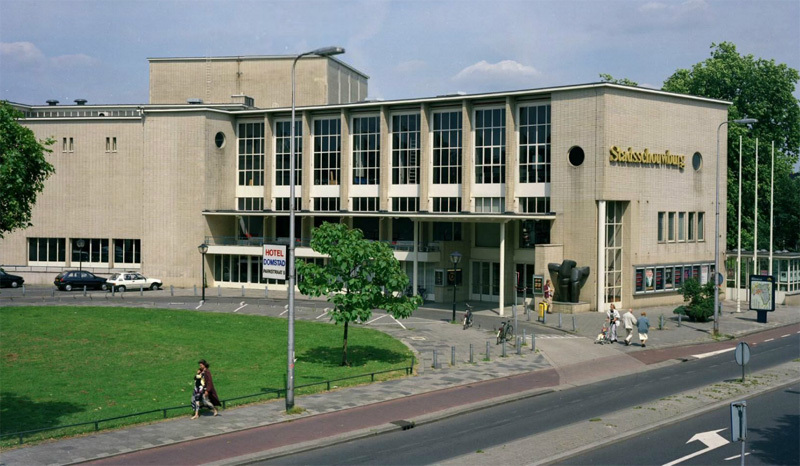 I positioned myself in front of the city’s theatre, at the east-west corridor leading from the Central Station to the university. It was around 2 in the afternoon on a Wednesday. That means school children under the age of 12 have the afternoon off. Because it is September, the students had just begun riding to and from the university again. I filmed for about 20 minutes how wave after wave of cyclists passed me by to get into the city centre. The people come in groups because they are held up by a traffic light that gives priority to buses, rather than people cycling, and this east-west corridor in the city centre is teeming with buses! I kept the original sound because it is telling what the city sounds like when private cars are not the dominant form of transport. Video showing people cycling into the city centre of Utrecht. As you could see this is very lively street and yet it so quiet and relaxed. But of course it hasn’t always been like that at this particular location. I know this area of the city very well. I went to secondary school here for 4 years, from 1977 to 1981. 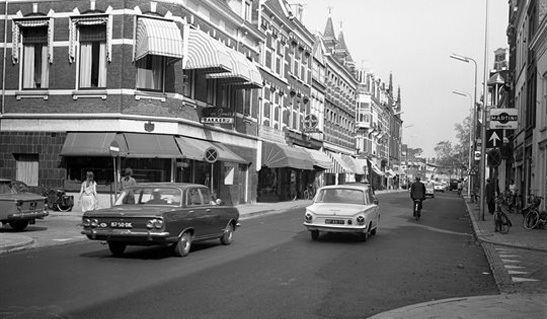 At that time the street was a dual-lane one-way street that was part of the city centre gyratory. There was no cycling infrastructure (apart from a painted on-street lane, but that doesn’t qualify as real cycling infrastructure in my book) and traffic could only use this street outbound. 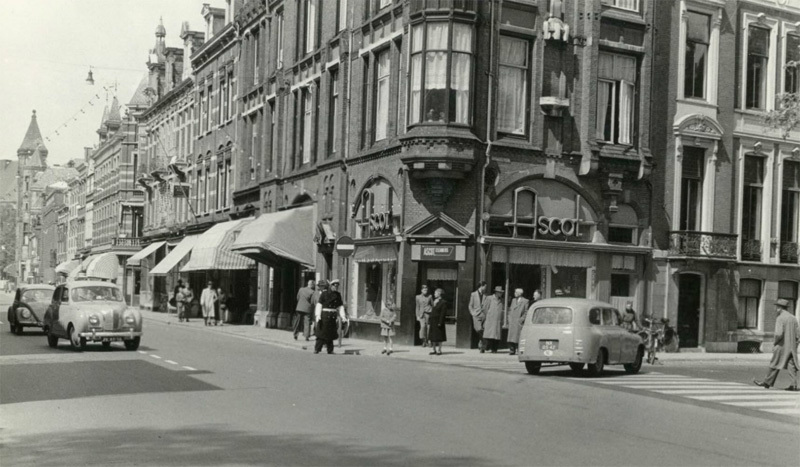 Pictures that I found in the Utrecht Archive show that the street had been a traditional street until the 1950s when it was made into that one-way gyratory. 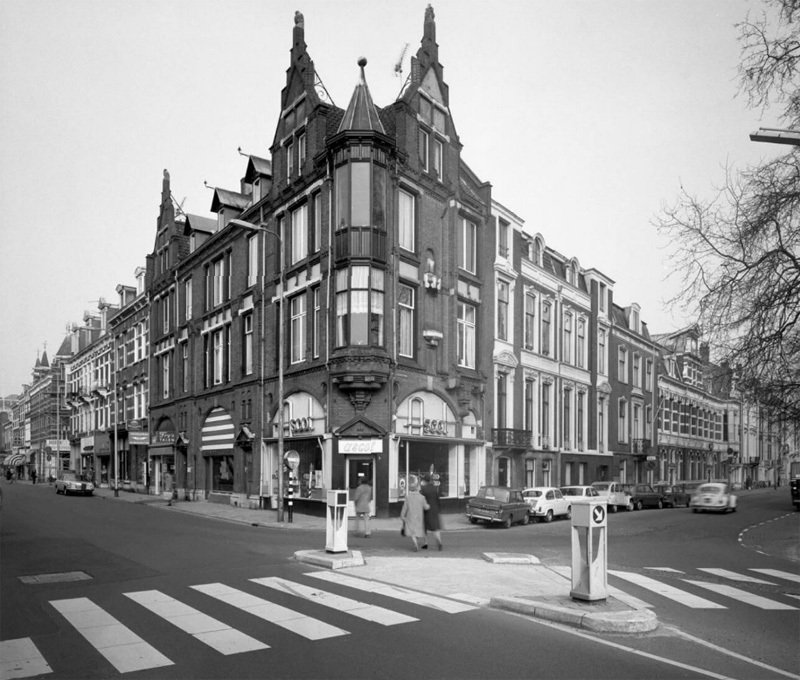 The 1990s picture shows that by then the street did have separated cycle tracks. 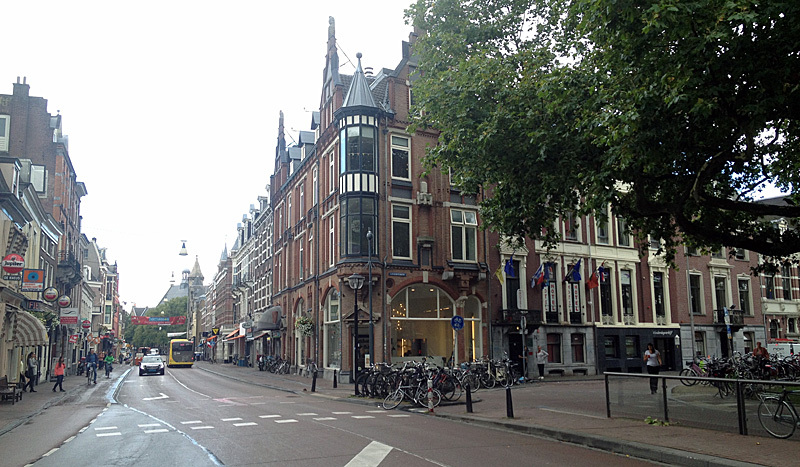 These Utrecht city centre streets worked as a giant gyratory. They were all dual-lane one-way streets and you could only use them in the direction of the arrow. This was the situation for the second half of the 20th century. Nowadays the most southern street is a bi-directional bus route and the south-east corner of this gyratory was blocked. That was also the exact location from where I filmed looking east. (Map Openstreetsmap, overlay by yours truly). It was only after the separated bus lanes were implemented (in the beginning of the 21st century) that the street got its current layout. The street is now a two-way bus street. Private cars are allowed to use the street, but only outbound. The street has separated cycle tracks on either side. In front of the city theatre the street is much wider and that extra space is all used to make the cycle track a lot wider there. 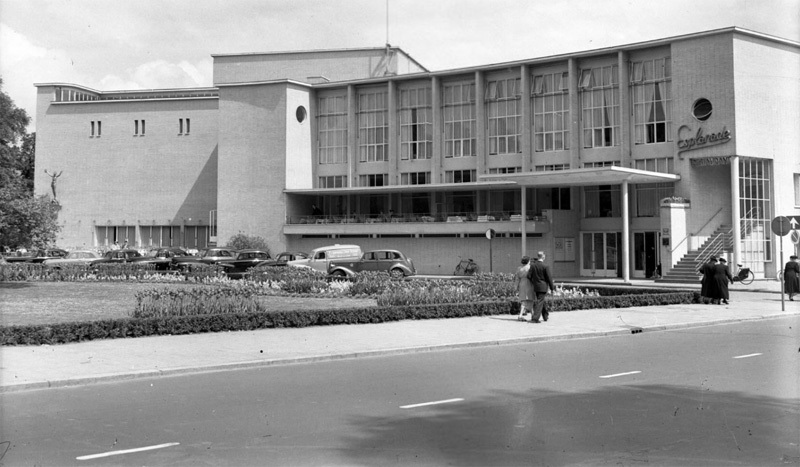 It may be used by traffic that needs to go to the theatre. So during the day that means delivery trucks sometimes drive there and when there is a red-carpet event I expect the limos will use it as well. But that is only occasionally. There is no parking here, so people going to visit the theatre for a play will not use it. For theatre goers there is a parking garage at walking distance. The city theatre in 2015. The street has mainly become a bus street and behind the bus stop shelter people cycle on a very wide cycleway. The corner where I stood was once a busy corner where it was hard to cross as a pedestrian. 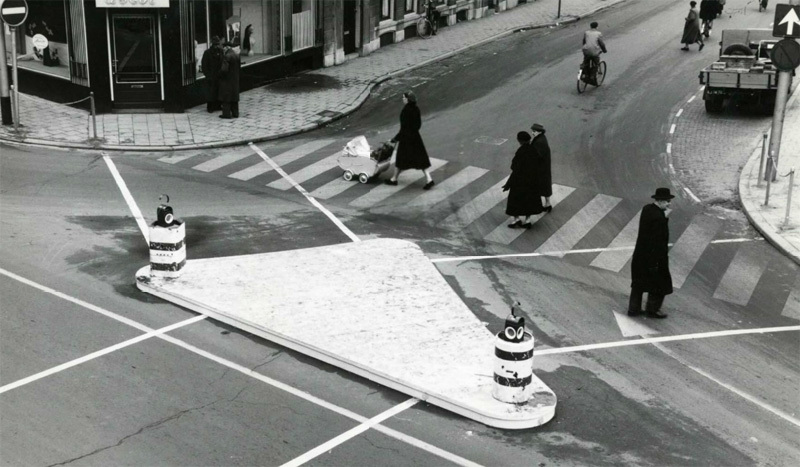 In the 1950s the city experimented with a novel design for the zebra crossing. A central triangular traffic island was created that had zebra crossings on all three sides. But motor traffic can no longer turn here. To calm traffic in that other street, turning into it has been made impossible. So at the location of the dangerous crossing there now is a rack to park bicycles. 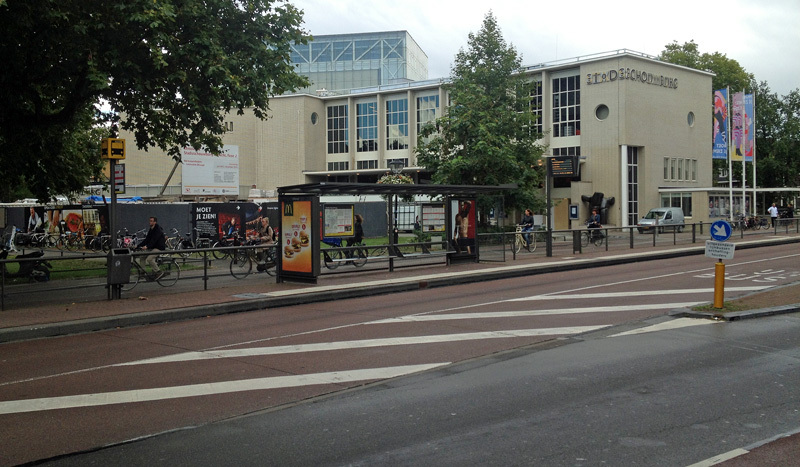 The corner of Nobelstraat and Lucasbolwerk in 2015. The street is mainly for buses and the turn into that street on the right hand side has been made impossible. Where the zebra crossing was, there is now a parking rack for bicycles. Without the zebra crossing people are again allowed to cross the street wherever they like. Cycling is now allowed in both directions on separate cycle tracks on either side of the street. It is clear once again that these streets didn’t become what they are today by accident. Deliberate choices have been made in The Netherlands to make the streets – especially those in the city centres – more for people than for through traffic. It changes the look and feel of the city so much that people from other countries have a hard time to see that their streets could be designed like this as well. That is why I keep showing those old images. The Netherlands is different now, but it hasn’t always been so different. That means change is possible, elsewhere, the same way as it was in this country. Good article. It’s amazing how bike oriented Amsterdam is. Love it! Hope more towns and cities in the UK become more like this. Coming from noisy, car-centric Australia the quietness of Dutch city centres – with lots of people moving but with very little noise – takes a while to get used to. I imagine it’s sort of what a Swiss cow in the Alps might experience when the sash supporting the giant bell around its neck breaks and it can move around without hearing any loud ringing. Here’s hoping to a nice long, mild autumn in Utrecht before winter arrives…unless you like the latter of course! These changes have mostly been achieved by moving production businesses like capenters, car dealers, all kind of workshops etc. out to industrial areas, and by building a network of through roads around the city. This made the city center an area for living and shopping. It greatly reduced the need for car traffic in those areas as well as improved the air quality. It lowered the fine dust particles, the exhausting of scents (think of large industrial bakeries) and other byproducts and consequences of industry by taking them out of the center and putting higher demands on environmental issues in the new locations. Thousands of businesses have been moved out or shut down this way. I presume it was the same in other countries, but I believe the Netherlands is one of the few places where it meant more cycling as well. I live in the US and usually ride a traditional Dutch bike (Azor). I think there are several reasons that utilitarian bikes are uncommon here. One is parking. Ground level bike parking in American cities is virtually non-existent. There is also a general taboo against leaving a bike outside for anything more than a very short period of time. Some of that is rational and some isn’t, as theft rates in some Dutch cities likely surpass their American counterparts. That aside, utility bikes are inherently heavy and are not convenient to bring indoors. People expect to need to carry bikes up stairs and choose accordingly. The other is a lack of infrastructure. While I find that a Dutch bike performs adequately on most terrain, the vehicular cycling style often required in the US makes a sporty bike very advantageous. Even when I don’t want to ride fast I find that I feel forced to accelerate and “take the lane.” The constant stopping and restarting at intersections can make a zippy bike more desirable. Finally, the market shifted away from utility and toward racing bikes in the ’70s and ’80s. We’re starting to see a slow diversification with lines like Linus and Brooklyn but the sporty styles remain popular. I find that many non-cyclists are curious about my Dutch bike and find it both practical and appealing. Unfortunately, some cyclists simply don’t get it and are dismissive because they regard it as a clunky cruiser. It takes familiarity with the practical accessories to understand the value of their function. Talking about deliberate changes. The city council of Los Angeles is planning major changes in favor of cyclist and pedestrians. There is no alternative anymore, this is the future, even across the pond. Hi Larry! Philly is a great city. I don’t know how far Downington is from you, but talk to Kate Robertson at LowRiders Bikes and Boards there. If she can’t help you, she can refer you to someone who can, maybe a little closer. Hope that helps. Hey, if you could, please like our FB at http://facebook.com/bikefive. IM me through the Facebook page if you need her email or phone number. Cheers, Bob. I love Bicycle Dutch. I always learn so much from this blog, so I want to share yet another of their great posts with my audience. Cheers! Being from the US what I notice is that 99% of the bikes have high handlebars compared to most of the bikes in the US. US bikes usually have versions of the T-bar setup of mountain bikes or drop down handlebars of race bikes. With most US bikes the handlebars can only be raised a very limited height due to the shortness of the stem and attached control cables. The higher bars would seem to take the pressure off the wrists and hands and also lower the risk of “going over the bars” during a crash. I’m thinking it may also make for a less aggressive rider-seems that so many bikers in the US especially on mixed-use paths tend to go way too fast as they pass families w/ children, dog walkers and other pedestrians. The natural dutch riding position is upright. You often see people riding without their hands on the handlebars, with one hand, switching between them, holding an umbrella or phone in one hand, et cetera. Based on that upright sitting position, the handlebars have to be ‘in reach’. You can’t easily let go of the handlebars on a mountain or race bike, without changing your position on the bike drastically as well. The types of bicycles commonly ridden here in the US is definitely vastly different than over there. When I was at the university, the most common bikes used were mountain bikes, followed by road bikes and then some hybrids and a few cruisers. It’s a shame that the ‘Dutch’ style bikes are not more widely available. Most shops don’t carry anything like it and people are often commuting on bikes that are not built for hassle-free commuting. But even within the cycling-friendly countries of northern Europe, I don’t think they are all like the Dutch. I spent some time in Copenhagen on several occasions and the bicycles used there are much sportier, overall. Some people do also have the typical oma or opafiets, but most bikes are a modified, sportier version that actually quite resembles the hybrids in the US, which typically also have the flat, lower handlebars vs. the upright ones. But even these are better-equipped for commuting than our hybrids because most of them still have fenders, lights, kickstand, bell, internal brakes and gears, with at least a partial chain cover. Many also have a rear rack, though it’s very uncommon (unlike in the Netherlands) for people to catch a ride sitting on that. With the exception of a few cities, most people in the US probably don’t even know about the ‘Dutch’ bike, though the internet is helping to change this. I own and use one everyday and so many people at work have marveled at the design; many of them have never seen anything like it before. Most US independent bike dealers can swap out handlebars for you at a relatively nominal cost. We put a pair of raised bars on my wife’s Trek hardtail for exactly the reasons you mentioned. We had to get slightly longer cables and sheathing, but it wasn’t a huge deal. I also agree with you about mixed use paths. I’m a Bike League certified instructor and I see people speeding along way too fast for conditions. I tend to do most of my riding on the street for that reason. If you want to swap handlebars, let me know what part of the country you live in. My work has allowed me to meet a lot of great indpendent bike shop owners and I suspect someone in my network would be happy to assist. This entry was posted on 8 September 2015 by Bicycle Dutch in Original posts and tagged history, Utrecht, watching people cycling.